Size of Male: 22-28 lbs, 11-13 in. Size of Female: 22-28 lbs, 11-13 in. Whether you live in a grand home or in a cozy apartment, the French bulldog can be a great indoor companion. A combination of clownish antics, affectionate character and well-tempered behavior makes this breed endearing to novice and seasoned pet owners alike. The roots of the breed are not wholly French but partly English. During the Industrial Revolution, bulldogs were transported by English lace workers and then bred with toy bulldogs by the French artisan community. The resulting breed?s pointy bat-like ears became a head turner in France. 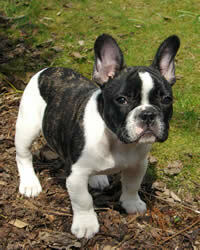 Pretty soon, the name “bouledogue Francais” or “French bulldog” was born. The breed?s popularity did not stay within France. It captivated America as well. In 1898, the breed was registered in the American Kennel Club. In 1913, it became one of the best sought show dogs in American history. If you want a pet with international charm, the bouledogue Francais may just be the right choice. This small dog breed is gentle yet playful, and quite a clown. Although it is friendly towards children, it is not that receptive to rough games. It tends to bond more with humans than with other pets and may appear shy during first meetings. You can expect a lot of snuggling from this very affectionate breed. Its genteel character is not to be underestimated though. This certified home body does not keep mum when it senses intruders. Living Environment – The great outdoor is not for this dog breed. Most do not know how to swim. The breed is better suited for pampered, indoor living. If you are looking for the best apartment dogs, this breed could make the list. Space is not an issue, but room temperature is. These dogs can barely stand hot and humid climates. Make sure your home has a functional air conditioning unit installed. Grooming – Coat care is not a high maintenance item for this breed. They are not heavy shedders. However, their facial wrinkles require regular cleaning because the breed tends to salivate. This breed is every busy pet owner?s joy. Occasional brushing and bathing are all that you need to keep your pet looking great. Diet & Exercise – The best diet for this breed is one made of fresh foods and real meat, a healthy blend that helps minimize flatulence. Exercise needs are minimal. Usually, a short, leisurely walk will suffice. Jogging and other lengthy, extreme outdoor physical activities are a no-no. Health – Although a tad healthier than an English Bulldog, the French version needs close monitoring and care. They are sensitive to hot climates. Their short windpipe accounts for breathing difficulties and respiratory problems. They also have the English Bulldog?s tendency to suffer from gastro-intestinal troubles. Many experience joint pains, heart defects and spinal disorders. Note: Do not rush any decision to have your pet undergo surgical operation. This breed’s compromised respiratory system makes them sensitive to anesthesia. The French Bulldog can take time to train but can learn amazing tricks if handled correctly. Despite its mild-mannered disposition, it too can be willful and independent. Positive dog training methods work best. It doesn?t respond well to harsh methods. The key to training this pet is not really a special set of skills, but patience and consistency. You will need at least 4 months to housebreak them.